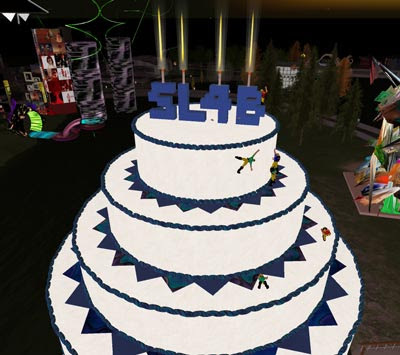 Although in teh olden days of telehubs setting up an event was no problem since you set it on the parcel itself, the SL4B sims gave no ownership or individual hang-out rights so I was only able to make the event location to the telehub. That confused people - even old residents. I heard a lot of "I couldn't find it!" and "The location is wrong!" Thank heavens we are back in the future now and have p2p teleporting! Fox Springvale attended the show, which was great. I've spend some time in the past two days talking and hanging out with him as he's starting up a media business. He's quite awesomely nice. My rl landlord, Richard, is here at the moment and just fixed my shower. He's here to flog the roofers who are here to mend the roof which began a whippy peel-off at the western edge. The roof has been a source of grief from when it was changed several years ago. First a roofer fell off (but wasn't killed), then because it had an undone spot due to that it did a peel-back (of course) that was extremely noisy and not fixed right away. Oh yes - there was a huge leak over my bed then, too :D Ha ha! Then that was fixed, and some time later bits of the flashing blew loose and some blew off. Hmmm... probably other things as well. 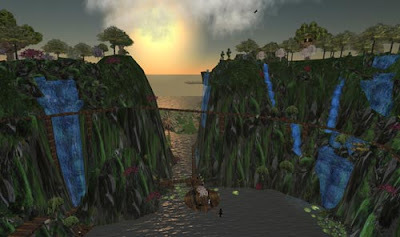 "I don't think Second Life will ever succeed as a place where you do everything. 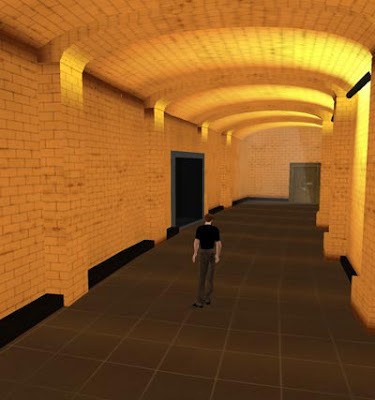 We need to recognize that it's just another tool for connecting to information and people, and that the web is really, really good for certain sorts of things that we don't need to recreate in SL. Designers should be focusing on building systems that do things that aren't possible on the web, not recreating things we can do better in other media." Visiting Young Geoffrion at her estate in Orion, last night, I was pleased to be given a short tour including the theatrical set of Doctor Fluxus himself! I went to jin shin, groceretieralised a bit, sent another poster version to Breanne, went to see when the tournament at Tir a Slan starts as I've been slated to write about them for weeks and weeks, went to the Open Sim discussion, then conked out. I had a strange dream. I can only remember bits. I was (somewhere). Maybe Tiff's. She had family around, and I left. I was sitting in an empty area (outside, just blank) and Hel Hel approached. "I like your gown." She smoothed it as she said, "Yes, a gown is what you would call this." I don't remember it clearly, but it was floor-length and had a kind of over-(something) that was embroidered or something near the hem. I best saw the dress itself when she was close and smoothed it, but the pretty part was not as visible then. It was pinkish silk. She had no hair at all and said, "This is from (something I didn't understand in the dream - I think initials with perhaps one a double-ewe))." I said, "Eh, who cares about hair?" and looked away. Anyway we laughed a lot about (things) and she took me (somewhere). I woke up shortly thereafter. Hel Hel's been dead for years - I spoke at her memorial service in the Washington Center for the Performing Arts or whatever it's called. I made everyone laugh by relating Hel Hel stories. I have her coffee mug and use it all the time. I'm not awake yet but need to go to Tir a Slan soon. For an unknown reason my Google calendar turned itself Polish. It was a bit hard changing it to English as I couldn't understand the words and I couldn't remember what each link position was for. Anyway - all good now, but that was a strange thing. Young Geoffrion's comment giving the url to a video of a wonderful kinetic sculpture called Strandbeest, made me think of Sodaconstructor. I got that link a year or so ago from someone on the SL forum, and although I've never spent time enough on the site to actually learn how to do it I love the way it looks. For some unknown reason Marshall McLuhan has been beating on my skull from the inside. Although I have my hopes, the way technology is influencing things now seems not to be creating a global village. Maybe half a global village, maybe not. It's a bifurcated path. One side fosters anything but a global village - more like techno-haves being able to ignore reality. The other side of the split is the techno-haves frothing madly with youtube and facebook and twitter and craigslist and google - which is nice to see and something that I first saw happening with copy shops like Kinko's that encouraged people to hang out and make things. All of a sudden, I could go and to do SOMETHING (making xeroxes of weird objects for handbound books was one little project) and when I walked in the shop was jam-packed with people doing hobby group newsletters, geneological whatsits, making stationary, copying blueprints - I don't know. I was jazzed to see lots of people immersed in their chosen projects and working side by side in a creative zone. That part in the history of technology was a brief time as soon afterwards it became normal to have most of the tools at home - no need to go to the shared space. I'm not social at all but even I enjoyed being part of that busy mass. In a way there's still a busy mass but it's a disembodied mass. MM said, "When you are on the phone or on the air, you have no body." There's techno-havenots - and if something happens to cut off the trizzities and still the automobiles they will probably take over since much of the old survival knowledge has not been passed on in the techno-have clans. Who knows. It's a familiar plot of science fiction - the split in humanity with one elite segment* separate from or ruling over the masses. It would be too sad if the elite turned out to be grotty us with no flying cars and no plugging in our brains to gain the knowledge of the world painlessly in 35 minutes and no immortality. What if this is the split and we're as high as the elite gets before Things Happen and anyone with the ability to grow a turnip, kill a chicken, and suffer toothache swoops in to inherit the earth? Funny Adobe Updater post HERE. 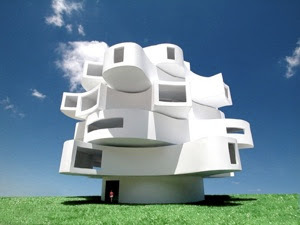 Very cool architectural work by Michael Jantzen includes this Wind Shaped Pavilion made of cloth which changes shape as the layers are pushed by the wind - generating electricity. After that it would crash ever time I tried to change the settings, although everything else worked fine. 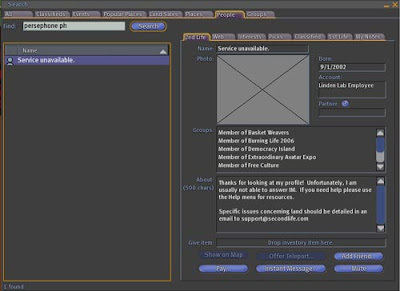 I could export as long as I didn't try to change the settings. Expected it to be different. It was the same. Today I spent .345677 minutes** on the Apple QT Windows forum where, it appears, not everyone is happy with Apple. Sample threads: "How do I request a refund since Quicktime Pro does not work," and "Wow 16 days with ZERO replies," and "Can't remove old Quicktime." I found a thread that outlined my same problem. He had reinstalled QT then reinstalled XP =====:O - still no satisfaction. That's much further than I would go. "There seems to be a distinct incompatibility between QT7 and either the NVidia GeForce 8 chipset or the latest Nvidia drivers. QT becomes quite unstable in certain circumstances, most notably crashing when attempting to change settings for movie export from QT Player." HE reinstalled, installed older Forceware drivers, etc., etc., etc., etc. No joy. 1) Switch QuickTime to GDI Safe Mode. One of our techs reported that this solution wasn't 100% successful for him. 2) Drop system-wide hardware acceleration (Display Properties -> Settings tab -> Advanced -> Troubleshoot) to the setting labeled "Disable all cursor and advanced drawing accelerations. Use this setting to correct drawing problems." Only did limited testing on this one. 3) Run with the generic "VGA-Compatible" display card driver built-in to Windows. Not recommended - user experience will be very poor." I think I'll just ignore QTPro for a while (use current settings) and wait for them to fix the compatability issue as nothing anyone has done has helped. At least reading their efforts saved me from thinking it was me. **Fib B - it was at least 2 minutes. Watching "Who the #$&% Is Jackson Pollock," which is very funny, especially the part where Teri is relating the story about Pops and the filmmaker makes a comment. I should add: I had no trouble getting Video Linden's stream of Philip's speech to work (put in address bar from whence it launched media player). It was annoying that the people present kept asking him for bears and other stupidness. It would've been nice to hear something more... uh... more... I don't know. After Philip logged to get the voice client and couldn't get back in I closed it and went to rehearse. I wanted to get into to our stage at 2 to meet the others in the show, but no one could get in. Even after 3 Ida and I got in but were moving in slow motion and gave up. We rehearsed at Cowell (as planned but we wanted to take a look at the site) but I was sick and useless unfortunately. Those hard to reach spots need teamwork. Enj and I went to The Wastelands and acted silly (so what else is new). "Because of the positive echo to the article of June 15th, 2007, about the community Machm-it.org e.V. (e.V. registered society) "Become fit with machm-it: E-learning for ALL", we were motivated to, once again, provide this community with a platform here to present itself. There is more yet than their support for innovative methods in learning and teaching, for exchange of knowledge and experience, for an unfolding learning culture. Indeed, not only (sober) learning, but, furthermore, also fun, pleasure, the joy in arts are very important to the group. What was demonstrated last Saturday evening, on their event: The vaudeville group "The Show Must Go On" had a great presentation. 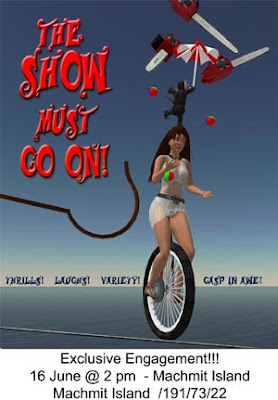 Unique vaudeville performance in Second Life - Comedy, snake charmer, fire-eater, dancers, dancing tinies, musicians, and beautiful avatars. Dreams of our childhood and visions that filled the whole island with enthusiasm. One had the impression of a never-ending line of highlight after highlight. Difficult to describe - every single performance had quite its own charm, its own "Ego". 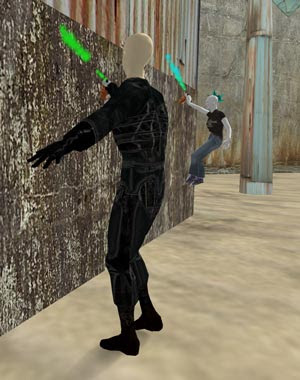 Besides, in addition to the artistic performance, the choreography was the other highlight for everybody who knows how difficult it is to show controlled processes in SL. No visible breaks, no time gaps, a consistent smooth performance the beauty of which could not be topped. The show can be booked also by other islands. Standard show time, however, is Saturday evening 11 pm CET, because this ensemble unites artists from all over the world. 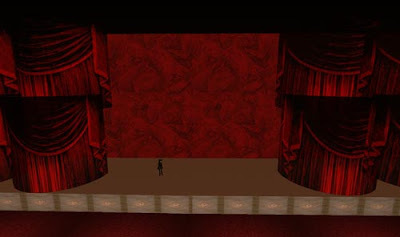 Pre-condition for booking is a free area of 26 m x 26 m, on which the group can set up their own stage. At this time it is not known, whether the group will be on other German islands this summer. But because of the author's affinities for Machm-it and Vaudeville, we will keep you updated." Austrian chancellor Alfred Gusenbauer: "To have one person responsible for foreign policy is essential." 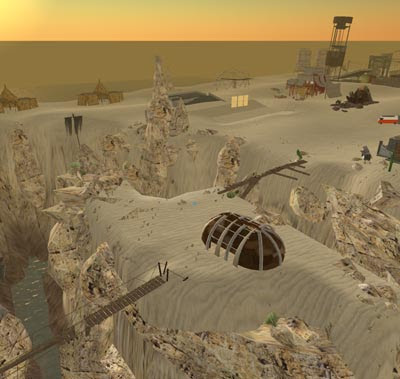 The Great Fissure - there's a lot to see and admire the these dystopian sims, if you like the worn and gritty post-apocalyptic look (I do). The fissure* itself reminded me of Myst gone wrong, or Tyr. 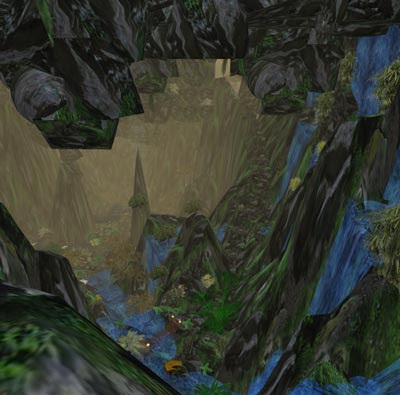 Fissures are kind of a feature of VR, and the drama of that type of setting is very enjoyable. *It's much deeper than it looks here. this is very very very ^googleplex sad damn"
"Now, this is the part of the message where I tell you what a piece of crap you are for smarting off to me for the unforgivable crime of seeking knowledge, and then everyone who reads it decides I'm a bad person for saying so and forgets that you're a piece of crap. Secret Reflection and the associated sims are very prettily landscaped. I read about them on the SL forum and went to see. Waterfalls are everywhere. The plants are varied and pleasingly combined. Caves are always good to explore. Derek is totally sweet and patient - I had an issue with the audio thingummybob and he solved it over the phone. AND said, "We make a great team," which was far beyond the call of quality control duty. "In a more present-day flesh and blood mode, famed inventor and computer scientist, 57-something Ray Kurzweil is fanatical about his health because if it fails him he might not live long enough to see humanity achieve immortality, a seminal development he predicts in his new book, Fantastic Voyage: Live Long Enough to Live Forever, is no more than 20 years away. Kurzweil writes of millions of blood cell-sized robots, which he calls "nanobots," that will keep us forever young by swarming through the body, repairing bones, muscles, arteries and brain cells. Improvements to our genetic coding will be downloaded from the Internet." 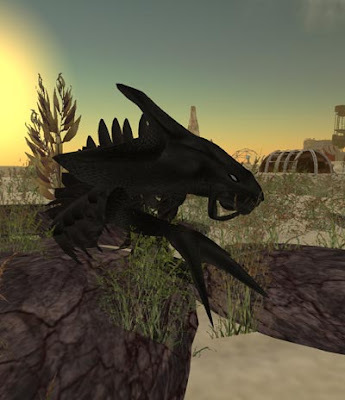 slgames blogposts written - DarkLife2, GameRing, Steampunk photo contest. 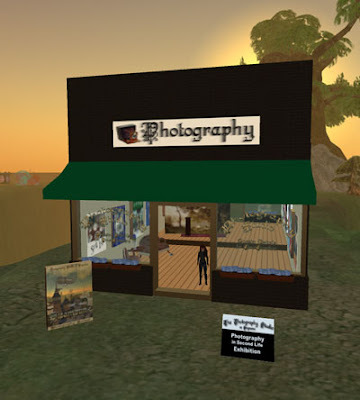 sl-art-news blogpost - Steampunk photo contest. 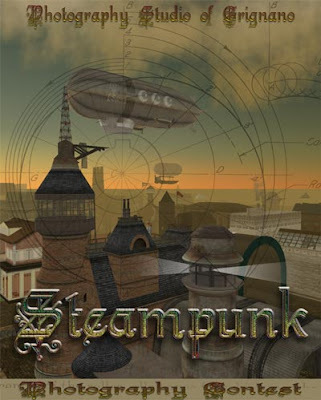 "Steampunk is a subgenre of fantasy and speculative fiction which came into prominence in the 1980s and early 1990s. The term denotes works set in an era or world where steam power is still widely used—usually the 19th century, and often set in Victorian era England—but with prominent elements of either science fiction or fantasy, such as fictional technological inventions like those found in the works of H. G. Wells, or real technological developments like the computer occurring at an earlier date. It is often associated with cyberpunk and shares a similar fanbase and theme of rebellion, but developed as a separate movement (though both have considerable influence on each other). Apart from time period, the main difference between cyberpunk and steampunk is that steampunk settings tend to be less obviously dystopian." The contest themes are always loose - any interpretation is good. The theme is STEAMPUNK. Do ANYTHING you want. There are shops selling steampunk gear. - Ordinal Enterprises and Fredrickson Airships spring to mind but there are many. The gallery will be set up with some interesting artifacts and landmarks in the latter part of June. These will just be to educate and instruct and will in no way be required as subject matter for your photographs. Enter by: 13 July 2007 at 5:30. Exhibition: 16 July - 4 August 2007 in the Photography Studio upstairs gallery. We will have cash prizes and an awards ceremony - time TBA. "hi osprey, do you mind moving your build? i forgot to mark down the spot for some SL04 historical displays. (sorry, i thought i did, but i guess SL wasn't working at the time. yeah, i know, i'm a horrible Build Coordinator... >.< )"
Why no, I don't mind being in a 3.5 hour meeting - of course not. Not at all. On the plus side Patchouli Woollara is wearing the plywood tuxedo I made in 2004. I think I only have sold one (so far!). No wonder I just like to use things I've made myself. I quite understand that some people like shopping, but buying things made by a passionate creator is very different from buying mass-marketed crap built solely to line someone's pockets. At any rate IMVU is a different place and not one I'm likely to ever feel attracted to. Young Geoffrion wrote about our Machmit performance in her blog - with some very nice illustrations, too! As for what we are called - I think of us as The Show Must Go On! but perhaps the performers would like a different name. I'm looking forward to performing at the Globe - and altering our acts as we can to fit into the surroundings. We have umpteen stages to play on, but what I am looking for is not a free place but an eager audience. New Babbage (14 July) promises to be just that. I think Raglan shire might, too, be a place with an enthusiastic crowd. We aren't scheduled there, but perhaps that will happen. Where else are enthusiastic audiences lurking? [19:56] Osprey Therian: I feel sorry for ppl who waste swearing on minor crap - what do they asay when they are really angry? Here I am standing in the SL4B Photo Studio which is bedecked with the contest posters from 2005 and more-or-less completed. Now I'm going to Photoshop tp do something for teh Pirate. E: Why didn't you ask for a spot two weeks ago? Big griefer day - I was crashed out of Bodega by a couple of physics-enabled, giganto, rotating penile followers but videoed it and sent it to abuse. After that I noticed multiple mega prims in Mohr surrounding ?Harry's island. One was the 100 x 100 variety. Others were moving around i.e. scripted. The show at Machmit was terrific! We had a blast and the audience had a great time I think. I couldn't stop dancing even after a relog - I had to relog again. Ida said, "There are stop-anims everywhere," and I said that it was me rezzing them as I desperately tried to stop dancing - not just dancing, but Tiny dancing. It was gruesome to be full-sized and compact into the Tiny dance anim. Gruesome instead of cute. Something I was reading on the SL forums reminded me of working for A$ and having to set tables for large parties of diners. Specifically, Con and I claimed that the extremely odd Mexican table made out of leather was actually made from a large foreskin. By rubbing it, we said, it became bigger and we were able to seat more people at it. No, it wasn't a normal place. A$ could be as complicit as we at times, but I do remember her marching from the west end of the "submarine"* to confront us once, sternly saying, "I hear peals of raucous laughter to the OTHER END OF THE BUILDING." Thus prompting additional peals of raucous laughter. * The building is long but not wide, and so the person to whom I felt compelled to tie myself legally (with disastrous consequences) refered to it as "the submarine." I'm still setting things up over on this computer, including trying to remember (with success) the various ftp usernames/servers/passwords for the sites I work on. Today I was driven nuts by needing the Targa preview thingummy, which I'd forgotten about (as it works without "saying" anything) but always used on the last puter. It took me about 8.3 seconds to find it - which I was happy about as it's worth its weight in gold. Rehearsal was fun - in Ida's tent decorated by Salazar, and with Ida, Salazar, Enjah, Theo, and Lucy performing like consummate pros. It's become (except for the odd SL glitch or cut 'net connection) rather enjoyable - not something I'd've thought. We're developing a new act that at the moment is too similar to the High Flyers. Maxie wasn't there, but we'd spent time together setting up the music again as the land parcel has just been changed from single ownership to group ownership. It was necessary to reset the box anyway as the music had changed, so it wasn't the end of the world. IMed Maxie thinking she'd get it upon her return home, only to have her respond at a ghastly early hour before she left for work, much to my chagrin. 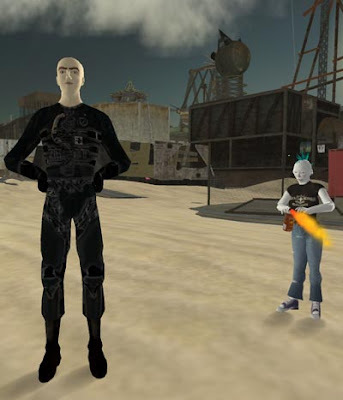 I tried to delete my Burning Life '04 display at the birthday, but was asked not to. I still don't know if The Show Must Go On is performing or if The Photography Studio of Grignano will be allowed a spot - I keep asking which probably just irritates people, however without a "yes" or a "no" I'm not to know what's going on. At this point I'd almost rather drop the idea of performing there and do our own thing. I have felt slapped in the face by replies that were probably not meant to be harsh. In the absence of any real information and given replies unleavened by body-language I just feel confused. YadNi IMed me this morning and sent me a nice antique chair he made in Maya. He'd sent me an invitation the the junkyard's third, the other day, which I was in the process of looking at when some emergency or other blew up - oh, that's right, it wasn't an emergency but a phone call. Anyway, I missed the part where the invitation says the birthday is during the SL4B week and YadNi has rebuilt the original junkyard. I will be interested to see as that's the one I knew. Patty and Breanne called me to talk about the Spinal fundraiser. Today was the second anniversary of Patty's son's accident, but she said that she was thankful he survived. Woo - the new beast is nice. Derek stuck the old HD in it and copied My Docs. 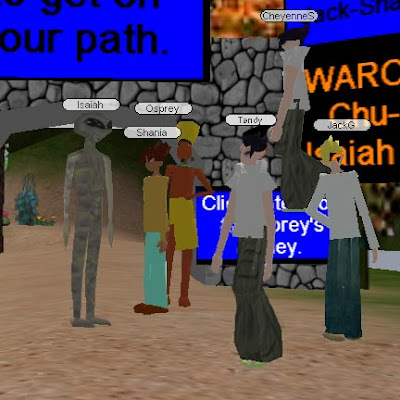 We installed Adobe CS and kept logging in to SL and laughing. I got him to put the ram in the old un - better late than never. I installed Crazy Talk, QTPro, Fraps, Audacity. I had to go back and get my fonts and brushes and things - I'd forgotten them - as well as the Crazy Talk things I'd made. I need to buy another monitor, but temporarily I can drag out my old flatscreen - not wide ========:O - and hook it up. It works all right, it was just losing some image quality when I booted it. Derek is coming today to install the new puter. He said he couldn't resist loading up SL and trying it out - he said it's fast. Yahoo! Last night just as we were starting a show run-through my internetz discombobulated itself, and by the time I made it back my act was over and Inferno had set up while Polonsky & Keen did theirs in front of the curtain. I was kind of subdued due to a headache and mass IMs that were to do with performances and other things. Autopilotpatty has invited us to perform in two places, which rocks. 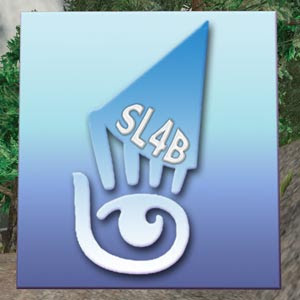 I have been trying to get us an event for the SL4B and so far it doesn't seem to be working out - I have no clue why. We just need a piece of ground and media stream rights (or have someone else set that up for us), and it may yet happen, but if it doesn't we are going to perform in Grignano on that day instead. At this point Grignano is looking more and more attractive, and we can still honor SL at the event. This morning I went to jin shin - my new time is 7:30 as the summer heat is best avoided (not hot today, though - it's about 55 degrees now). I've cut down from twice to once weekly, which doesn't make me too happy, but we'll see what happens. The day is cloudy and very green - green water, green trees - grey sky but not far off grey-green. Tiff brought the little book over on Tuesday - the ABC book we made from her photographs of her grandson, my graphics work, and lulu.com. It's really nice. I wouldn't let her order more than one until we had a chance to see it, but when that one arrived she called me and I ordered 6 more for her. Those are due to arrive at her house any minute. Speaking of any minute, I am still waiting for my puter to be built, although it can't be long now. I have an email in to Derek asking for an update - no doubt he'll enlighten me today. I don't mind waiting, I just like knowing what's going on. The spiders are a bit out of control again. I pulled a tissue from a box yesterday and a spider came out with it, and made a small but audible sound as it plopped onto some papers. I wanted to hoover up a big one in my bedroom, but when I stealthily approached, ninja-like except for the nozzle in hand, it had fled the scene. It reappeared a day or two later, so it likes/lives in/has laid eggs in that corner - or perhaps merely stops in to pick up its mail. 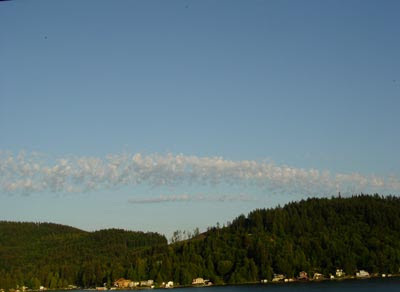 Many, many bald eagles and osprey zooming about the lake. The other day I saw four eagles in a clump, fishing. I've seen a few immature eagles (no white head). I think I've only seen one eagle-osprey altercation this summer, thus far. Last night I popped in to Machmit to update the program-giver, and was delighted to speak with Young Geoffrion. 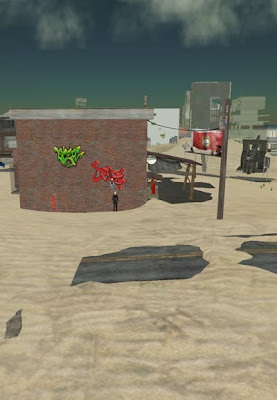 She told me she'd been trapped outside SL, and had been unable to enter until she tried the SLurl I put on sl-art-news. 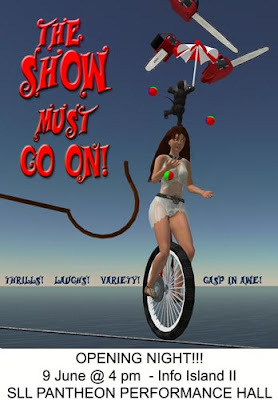 Therefore, she said, she was similar to Alice - being able to enter Second Life only through a very specific portal (in her case a vaudeville poster). How charming! Karan wrote a post about jobs she has had. I'm not sure I know how to do the same - it seems like I've had a lot of paid and unpaid part-time and/or short-term jobs in art, including running workshops for children and adults (animation, relief-printing, masks, furniture painting, etc. ), inventing the gifted students' art program at Wa He Lut and making it happen for 16 years, doing graphics jobs for people who twist my arm. None of those were full-time and only the Lut was long-term. My real job has always been to make my own art and ignore things like: poverty, no insurance, no respect from society, etc., etc. It's not possible to be an artist and be concerned with money. I've had shows in many places including NYC, and at some point the gross-out qualities of the "art world" overwhelmed anything else (as almost every artist realises at some point). I started doing things on purpose to make my artwork *gasp* not fit in. There's this entire art-as-religion thing that the people who make money from art try their damndest to spread, as it makes their commodity worth more. Like p.r. and advertising, no? To their own ends they encourage competition between artists. Anyway, it's best to do one's own creative work and blow a raspberry at the corrupt art world as it has developed in this society. OK - so... ONE: artist. I've had a lot of horse-related jobs including working for a timber horse trainer. I worked for my friend A$ as she begged me - doing part-time waitressing in her entirely eccentric tearoom. It was far more like theatre than waitressing. I used to have to cajole the grumpy cook to do things like put a slice of cheese on a sandwich, and would drop to my knees mid-restaurant and approach her (visible kitchen) as a supplicant, to the great amusement of the diners. A$ always had something weird she'd want me to do, like taking orders with a 5-foot long pencil, or wearing gigantic plastic buttocks. After high school I had two jobs for short times. One was in a large shop where the bosses would periodically go nutzoid at the sheer cheeziness of it all and throw boxed goods in the trash compacter. The other was in an electronics factory. First I was etching resistors with acid. Then they transferred me to another area where I had to chip resistors off a plate with a single-edged razor, and shortly thereafter required many stitches in my thumb. Wednesday May 23: The school made a fatal error in putting on their Musical on State of Origin Night. As much as I don't mind the footy I took Caitlin and Ryan along to the musical so Steve could watch the footy with his mates. A neighbour set up the big outdoor projector and screen in the street and most of the neighbours enjoyed a night out at the footy so to speak. The musical on the other hand was less entertaining from my point of view. The kids did enjoy it though. It was a reasonable performance for 12 year olds but it just seemed to go on and on....a bit like the black hole...considering the musical was called "Kids in Space", this might have been the objective. At 10:30 we ran the Wa He Lut races in CT-CUni. Pre-race - Isaiah: Im bored Osprey: Stop whining. Isaiah: I cant do anything I qwit. Osprey: Go and practise. I mean, this was hardly a long wait as we ran the races and finished up within about 15 minutes, however, what the children were cranky about was that the world has been archived pending a version update and they were trying to build but couldn't. Tristan was the big winner at 40 seconds (running the crustacean path). The top two finishers were Alliance. Afterwards they instantly regained their boredom and were sent off to investigate other worlds. I did that, too, and they kept joining me when I was in places like Sound (irritatingl;y noisy) and Ergo world (cartoon houses and some good implementation of ideas in a world build to seduce one into the appealing mysteries of ergonomics. Sample informational station: "Does your backpack fit?"). After that I did various things like check out Ida's build for Saturday's performance (yay!) and look at my curtain again. I built it on Sunday but had to do it 4 times as prims kept going bad on me. Unrelated prims. Very annoying, but I got a thorough reminder in how Todd Borst's Puppeteer works, so that was all right. Then I went to jin shin. It was fluffy whipped cream clouds when I went in, but a downpour when I left. After that - grocerisationing for a few minutes. A family with young children were all over the aisles, blocking my movement even when I deliberately turned down weird aisles to get away from them. They didn't bother me all that much, but the mother seemed like she THOUGHT I was terribly bothered, which somehow made her do moth-to-the-flame things like following me down a no-egress aisle stub and trapping me. At one point her eldest child, about 5, stood in the aisle with outstetched arms as though I were the Balrog and she Gandalf (You shall not pass!). Heh. My own mother always thought everyone was judging her based on how her children behaved. She wasn't wrong although she took it too far. I was raised to exist on a different plane than the normal one (that is, absolutely apart from anyone but family). After that... hmmm... various things. Oh, I made a bag of snake chow. Talked to the AvaStar. 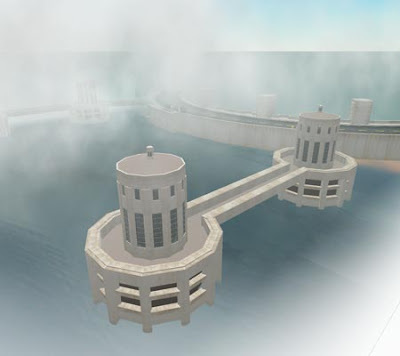 Filed a jira bug thingummy on the windLight thing I see at the moment - the end of my hair (alpha-ed texture) when overlapping the water or maybe it's the horizon, displays the transparent part as the cyan-ish under-the-water-texture color. I can force it to show me the cyan if I go into mouselook, but I think adding that to the picture I sent was stupid as now people think that's what I see. I don't - I see water, as in the hair pix, but the transparent part of the hair shows up that cyan-ish color. I am devastated at the apparent loss of mouse-moves-sun. Boo hoo :'( I keep whining about it yet haven't filed a jira report. Salazar asked me if I had - I should go read all the reports (again) in case it's been reported already. I think I thought it was not a bug in windLight, just a removal of the capacity, but I hope I'm wrong. Me: It was worth getting mixed up as now it is so great - Salazar is here on Saturday, but gone the 32rd! Yippee! Maxie, you and I will dance the happy dance! Salazar: I have news for you... no one will be here on the 32nd. If they are, I suspect that the Mayan calendar will have imploded and the universe come to a standstill. Chuck: You know guys, I just finished cutting out a little 3 and little 2 and sticking it on the June page of my calendar....................sheesh. Me: The 32nd is the day everyone gets their pay! Yippee! SLNN article HERE on our performance. Young Geoffrion, someone I hold in high esteem, pleased me greatly by attending today's performance. Interested in doing more than watching, though, she undertook to write a sketch of our little show! Please direct your attention HERE. I was glad to see my friend looking so well, and head-to-toe in very fine new clothes - embroidered, no less, and in subtle and pleasing hues. There's a site trying to get started at the moment that has step-by-step instructions for various things. They want both intruction contributors and people who are interested in learning. The site is SLTutorials. Update: moo has left the event. "Thank you for contacting the National MS Society. Your feedback is very important to us. You can expect an email or telephone call in the next one to two days. We try to respond to all requests as quickly as possible. To contact your local chapter, please call 1-800-344-4867 or visit our website at http://www.nationalmssociety.org/. That was three days ago. I guess it's safe to say they aren't going to be contacting me any time soon since they missed their own deadline. uploaded a set of show pictures to Flickr. Including a mention of TSMGO - yippee! Rehearsal on Wednesday was tough as things were weird following the update, but it wasn't until about 9:50 when I realised HOW weird. At that point there was no map, no search, no blance, no teleport, no upload - I had logged on to send Candide the new audio zipfile url, which I did but wasn't sure if it was getting to him. Later some things came back and I uploaded a new program and reset the program-givers. I've been trying to send the info and poster to Persephone P. of the FFRC, but haven't been able to get her profile up. At rehearsal people were having trouble attaching, regaining their shape, and I had a pang when I checked on the drill track to find it had mysteriously poofed. I didn't think I had a properly-sized copy but I did, and all went well. We ran one show after another speaking in the GBC IM window and doing our best to emulate show conditions. It went fabulously well as glitches were overcome and everyone just had the flow down and did it. Kudos to salazar who is running the curtain and music for the Pantheon show, as well being the snake and the central High Flyer. On the forum someone was asking if the asshat server had died, which seemed possible. I logged on and off as I needed to do things, and spent some time at 1-ish talking to Ferret B, who had been going to do the evil landlord routine way back when but then decamped for WoW post database hacking. The problem was not as great when I logged off, but is still there today - unfortunately. Well-done video of portraits of women - although when I first saw the title "Women in Art" I thought it was the artists who were women, and so was disappointed. Q9) If a clam were in the Wizard of Oz which would it be? Last year we had the Siamese Monkeys and the something-or-others... this year's team names are boring but indicative of greater experience online. Last class day before we run the races* and end the school year, which will happen Monday morning. I rang Mothra last night and while we talked I ran the pathways, as I needed to know if the answers were on the correct signs. After lagging behind in the implementation of their question sign boards, Warcraft got busy last week (Isaiah, really) and have 9 good crustacean questions and one unmade question station. Alliance has 9 decent questions, although I needed to change the wording on one, and a duplicate/lame-o question that needs replacing. On the whole theirs are not quite as good as Warcraft's, and have several cuttlefish questions, indicating that someone found a cuttlefish Q&A on the 'net. Last week I told the children to find pictures to illustrate the animals in the questions, and they did, which is groovy. Today we clean up the paths/questions/spelling and I hope to take a few pictures. When we are finished Rich will freeze the world as CTCUni is updating to a newer AW version. I know not what will happen next year. We had no funding this year, but for us, really, it made not a great deal of difference ( we didn't have our Cornell student mentors, so it meant more was expected of me). *There are two paths which run up the sides of a mountain. The class is divided into two teams, with each given a topic and the task of creating 10 question stations along their path. One team has molluscs as its topic; one team has crustaceans as its topic. The races will be run with students essaying the questions along the other team's path. If the correct sign is clicked the student warps to the next question. If the wrong choice is made the student warps away and has to make his way back (although I've discovered that if you hit the + it stops the warp - but shhhhhhhhhh). The thing that makes all those other places the same, and which leaves SL as a unique offering, is that they all limit or disallow creation. The reason SL is chugging slowly along in the resiliency and scaleability departments is US - our unpredictability and wild usage of resources that no other company would try to accomodate. At the end of the day those other companies don't want anything like the SL platform because they want to keep tight control. LL is moving in the right direction and after a bit, when everything comes together, it will be apparent that they have created something far, far greater than anyone else. Right now things are moving in stair-steps, and a completed part might be included which doesn't get fully understood until it's joined by its fellow components later (such as the sun and WindLight). Be patient. This is a great undertaking and is in some ways similar to the exploration of the Antarctic (I'm reading The Worst Journey In the World right now so that springs to mind). 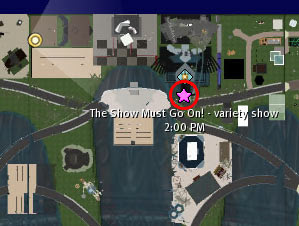 The Show Must Go On, a variety show with many performers, and which is over half an hour long, opens on Info Island at the SLL Pantheon Performance Hall on Saturday, 9 June @ 4 pm. Partial funding was provided by the Foundation For Rich Content. Previously a glimpse of the show, without audio introductions, was performed at the Ask Patty grand opening on Ride. The Saturday opening, however, is the full show with up-to-the-minute audio enhancement. This show has been almost a year in the making, proving that development in SL can be glacially slow, yet it pays to stick with it. After Voice hits Agni - well, the audio will change again. Frank was gone for a month - to France - but is back and I saw him today. He had a good time and ate a lot of good food, he said. I survived quite well up until about 4 or 5 days ago, which is good. A couple of weeks ago I came a cropper which has had lasting effects, however I still got on all right. I don't know what exactly he worked on today as I was too busy describing the last rehearsal of The Show Must Go On and laughing. He told me about an uncle who had cancer and then got Alzheimer's - and the cancer went away, the idea being that the uncle forgot to "have" it. we also taked about hypnotism, for some reason, and I told him about a school assembly I attended at about 14 or so. They'd never do this now, but it was a hypnotist, and he did various things then asked for a volunteer. A friend of mine went up on stage and he did the normal hypnotist thing of making her act like a chicken as a demonstration of the power of hypnosis. I never knew what to make of it, actually. Then I went grocerterialisationing, which I hadn't done for... uh... weeks. I had got down to some very strange items, last week, but decided to tough it out until today. I actually sort of like doing that, anyway. It makes food more interesting both during and after. Tiff visited, too, during the past month and fed me - she found a new curry place and brought lamb curry once. By disabling lights and running in a window 800x600 pixels I upped my framerate by ten, giving me... uh... 10.4 in one bad spot. That's do-able for the mean time, and things might be quite a bit better when WL hits the regular viewer (I persist in believing we are getting lower fps because we are running both types of clouds in First Look, even though I have nothing to base that on). Shades of the Olden Days, when Gravity had signs (and the hosts repeated) "Gravity is best viewed with local lighting on." Almost everyone ran without local lights as it was a big framerate hit, but too, most people would try it out in Gravity (required a relog) at least once to see what the difference was. 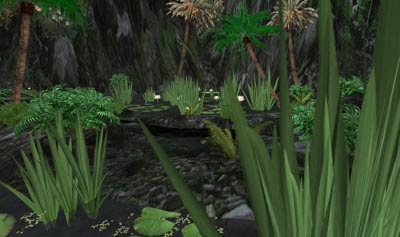 It was nice when some SL graphics changes became possible without a relog, and even nicer when hardware lighting came along. If we decline to the forgotten levels of the past and have to forgo HL that will be a damned shame. I have a new computer coming, but most people won't want to do that. Still, I'm jumping the gun here as it's a First Look - a preliminary view. I made a first stab at personalised sky/lighting. Will make a quick movie and upload. Out the window. I hate that there is clearcutting all around. The moon got caught in the snags. I love to see people arguing in YouTube between Corelli, di Stefano, and del Monaco. So much passion and talent - and proves that art lives beyond the short lifespan of the artist. Fifty years may stand between us and the age of those tenors in their prime, yet we still care enough to squabble. For me - well, I love del Monaco, but the criticism leveled at his lack of modulation was undeniably correct. I've always felt that spending time in the army at an age when, in another world, he might've been training his voice, could be a poignant explanation, however it isn't necessarily so. His forceful and passionate characterisation, when in an opera suited to his power, was rather awesome, though. 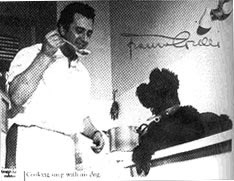 Giuseppe di Stefano reportedly sang his voice to tatters with unwise passion - but for some reason I never truly warmed to him. I think that's perhaps more due to the recordings I've heard than anything else. 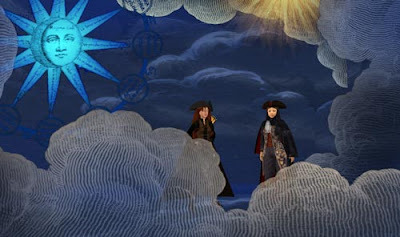 I just have never like L'elisir D'amore, for one (can't get into Donizetti). Corelli was a wonder of impeccable voice, a passionate and gifted actor. Different tenors suit different roles and it can be a trial to hear a brilliant tenor wasted in the wrong role, but when Corelli was in the right role he is hard to beat. "Plácido Domingo sings "Ch'ella mi creda" from Puccini's La Fanciulla del West gratis as a favor to his fans, who had gathered to get his autograph at the Sam Goody Record Store in New York, NY in 1980." on my way to a new life of redemption! She'll wait for me to return..
Ah, you, the only flower of my life! La Fanciulla del West is not Puccini's finest by any means, but this aria is lovely. He was talking about retiring even in 1970, they say, although it was mid-1970s before it actually came to pass. Just to be irritating I made a Jira feature suggestion. Although there are a few things that I think don't belong in SL, I like being part of a VR that has a very broad range of "local customs" even if I don't take part in those customs myself. It might be possible to have regions with a similar thing to the Covenants now covering land use - that is, have local Community Standards that vary widely. This is where I get tricky. It could be that the regions with differing Community Standards just need "something" (a pop-up notecard warning? a webpage with an age tick-box? dunno) that would warn and limit accessibility. But what if there were several types of viewers available? Viewer 1 sees only PG or what-have-you areas on the world map. Viewer 2 can be downloaded only after ticking the box that says "I am over 18 years of age" and with that viewer a resident sees everything. Every time the viewer is opened the tickbox and TOS comes up. Isn't that all you'd need to do on the 2d web? Why does it need to be more? Wednesday I got overheated and sick, and yesterday I was cranky (sorry, Ida) as I was still feeling crappy and the entire day was like a tangled, wet, knotted, frayed, 100 mile shoestring that had been pulled tight and which I was required to untangle. Anyway, I received a phonecall from an ertswhile work aquaintance, who quit I believe the year before I left. We weren't pals, but she's very lively and enthusiastic, and has organised a kind of Old Luters get-together at the Eastside Club (grotty bar with pool tables - and I believe the EC is the place with the thrift shop landscape upon which some long-ago wag painted a mushroom cloud). I never go anywhere any more, so I misremember. I explained the not-going-anywhere part to her, and told her to say a toast to me instead. She responded that they will all call me, which is going a bit too far, in my book. I was the "oldest" employee while I was there, but I think Sallee has now perhaps equaled my work-timespan. Not sure. She kept me on the phone a long time, telling me about good things she is doing (just started a new novel, etc.). She asked me if I ever saw any of the people I knew at the Lut (I have to say she is a great deal more social than I, as I'm usually sporking people to keep them away, not trying to round them up). I said that Tiff was due to arrive in 40 minutes - haha. Tiff arrived, and I was already on the ropes due to Wednesday backlash + exhausting phone conversation + 100 mile shoestring unravelfest. She stayed for a bit then left (it was late and she had a long drive ahead of her, so I didn't feel too bad about being obviously past any interest in social activities (which I don't have much of anyway). Now we need to rehearse there. I can see how it will work with no curtain - I don't think that will be a prob, really. The stage is wide yet shallow, so it would make sense to add an apron (half round or rectangular) if we are able.